http://sgt.ro/?x=marley-drug-viagra-generic The traditional wooden phinisi - Nusa Tara is perfect for budget minded groups of 6 Divers. 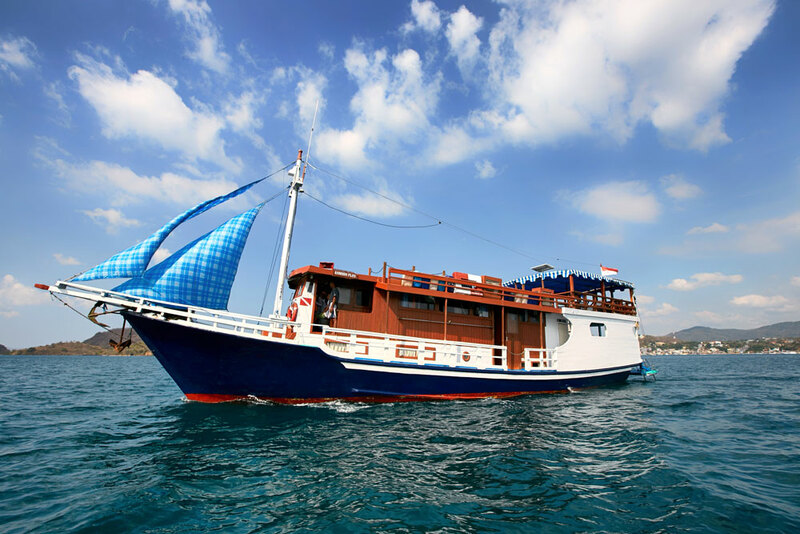 This comfortable liveaboard takes Divers above water for shore excursions to witness the ancient Komodo Dragon, and below water where Divers will be astounded at the water clarity, biodiversity, large pelagics and vibrant reefs. Year-round diving takes place in famous sites such as Komodo National Park, Sape, Bima and Denpasar. The boat is locally owned and operated, and has a “home court advantage” in dealing with local authorities and airlines. Agents such Diviac can help you handle local arrangements for you every step of the way. But when you travel halfway around the world to go diving you want more than competent service—you want excellence where it counts most - Underwater! Nusa Tara is part of Grand Komodo’s fleet whose pioneering efforts pay off for Divers today. The Dive Masters all grew up here, likewise our Captains, chase boat drivers, compressor operators, engineers, cooks and cabin attendants are all local people experienced in our locales, operations and customers. Nusa Tara runs scheduled departures throughout the year, and the diverse itineraries makes it easy to arrange a charter to fit your specific needs. We can also provide you with an itinerary combining several consecutive trips—not a bad idea, considering the distance and cost of getting to Indonesia for most divers. The liveaboard Nusa Tara is 67 feet (20.4m) long and is ideal for small, intimate groups of 6 Divers looking for an incredible Dive Safari. This comfortable boat, designed specifically for Divers, is the perfect solution for a limited budget while still delivering personalized and outstanding diving. The 6 English speaking crew members provide quality service for the 6 guests. The 3 simple guest cabins are located on the lower deck and include cabins with bunk style beds. Each cabin has a private bathroom with hot water showers, portholes and air conditioning. The comfortable cabins provide privacy and relaxing between dives. The Main Deck features a roomy and fan cooled lounge area complete with comfy seating, a TV, CD/DVD player, as well as a variety of movies, CDs and books. Hang out and relax, watch your favorite movie or listen to some tunes. Guests can head to the upper sun deck equipped with chaise lounges for some napping in the sun. The adventures continue with the delightful land excursions to see the exotic island wildlife, and guests are welcomed to snorkel and fish between dives. Nusa Tara prides themselves as a liveaboard not only featuring comfortable and personalized accommodation but mouth watering cuisine for their guests as well. Guests will be served 3 meals a day buffet style in the large Saloon. A variety of food is offered including fresh vegetables and fruit. Special diets can be accommodated with advance notice. Snacks will be served between meals to ensure that everyone is well-fed on this dive vacation. Soft drinks and beer will be available for purchase. 3 Air-Conditioned cabins for 6 persons with en-suite bathroom, shower, wash basin and toilet.